The Swing chapters discuss various aspects of working with a GUI, from the very basic concepts of developing a Swing application, to the most advanced topics, such as decorating a Swing component with a JLayer, drag-and-drop features, Synth Skinnable L&F, etc. 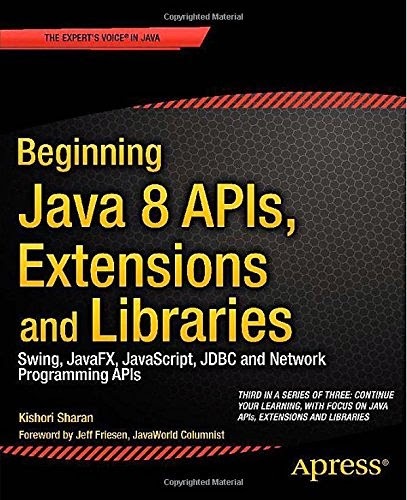 The chapter on network programming covers the basics of network technologies first, and then, the advanced topics of network programming, using a Java class library. It covers IPv4 and IPv6, addressing schemes, subnetting, supernetting, multicasting, TCP/IP sockets, UPD sockets, asynchronous socket I/O, etc. The chapter on JDBC provides the details of connecting and working with databases such as Oracle, SQL Server, MySQL, DB2, Java DB (Apache Derby), Sybase, Adaptive Server Anywhere, etc. It contains a complete discussion on processing a ResultSet and a RowSet. It discusses how to use the RowSetFactory, to obtain a RowSet object of a specific type. Working with Large Objects (LOBs), such as Blob, Clob, and NClob, is covered in detail with Java code examples and database scripts. This tutorial is for Java programmers who are familiar with the fundamentals of the Java language and Java programming, who are now ready to call upon the power of extended Java functionality available from the huge array of Java APIs, extensions and libraries.